The rear of the renovated Fortmiller Building gleams in the winter sunshine on Monday, Jan. 16. The city-supported renovation of the Fortmiller Building at 420 Third Ave. S.W. looks nearly complete, at least from the outside and from the back, and on Wednesday the advisory board of the Central Albany Revitalization Area plans to take a look inside. The CARA board scheduled a tour of the building before its 5:15 p.m. meeting on Jan. 18 at City Hall. 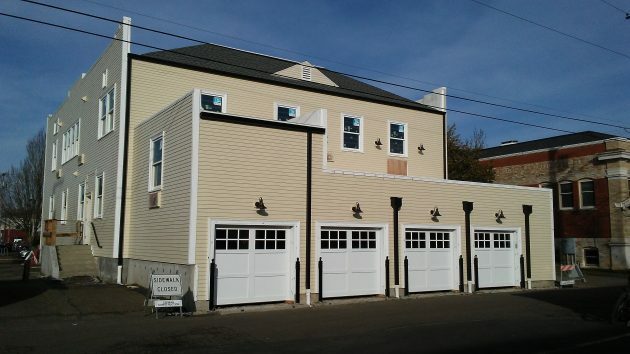 In March 2014, the CARA urban renewal board authorized $336,000 in aid toward Scott Lepman’s project, which included renovation of the bighted building and was estimated at the time to total $1.6 million in cost. Built in 1930 as funeral home, the structure was to be fixed up as two offices and six apartments. In addition, Lepman planned to build townhouses next door, but then it was discovered that this couldn’t be done under the city’s development code. Instead, Lepman agreed to build units at 224 and 234 Third Ave. S.E. Under a revised set if deadlines, the Fortmiller job was to be finished at the end of this month, and the new townhouses on East Third by July 31, 2018. According to the CARA board agenda for Wednesday, Lepman is asking for an extension until the end of 2018. The city staff is recommending approval. On Monday afternoon, the sounds of construction came from inside the Fortmiller site. Much of the exterior appears to be just about done, though the front still needs finishing. Once again, the taxpayers are funding a private project for the benefit of the owner. The assumption that increased tax collections based on increased assessed value will “pay” for the project is immaterial. If you “improve” your house, nobody but you will pay for it and the city will increase your tax bill anyway. CARA is flawed and should be dropped. Tony is correct. We need to ask ourselves; Where does governmental legitimacy and power come from? They don’t come from elected officials or written documents such as constitutions, state laws, city charters, and urban renewal plans. Legitimacy and power come from the direct consent of the governed – individual citizens. Given that legitimacy and power originates from the people, can the people grant a power to government that the people themselves do not have? The answer, logically, is no. The people have no power to take someone else’s money without consent. So the people can’t legitimately grant such power to city government. This can only mean that CARA is illegitimate. The moral thing for the city to do is acknowledge this illegitimacy and exercise its power to abolish CARA. Much more to it than this.. If CARA is what it takes to keep downtown Albany from turning into a wasteland that no one wants to invest in than its a good thing. It’s not something that would be better off just ignored and let go, something had to be done and I for one am glad someone did something. It is a benefit to all that live in the area having the area rehabilitated. Are you serious? You imply that city government is the solution and the free market to blame for Albany’s blighted downtown. The fact is city government cannot “stimulate” ” or “renew” anything, least of all the economy downtown. All city government can do is extract money from the private sector and move it to another use. In CARA’s case, they steal tax revenue from other taxing districts without their consent and use the money to pay off CARA’s huge debt. This means the other taxing districts will spend less, or find new ways to extract more money from the taxpayers, while the city will spend millions more. That isn’t “stimulation” or “renewal” by any definition. And it’s ridiculous to imply that the private sector can’t counteract blight in the downtown area on their own. But to do so the private sector must first be free to act. With all of the government imposed land use regulations, historical restrictions, zoning and building codes, and more, the local market is hardly “free.” Given multiple layers of regulations and bureaucracy can there possibly be a free market? No. We do not have a free market, so don’t lay blame there. There is much local government should do, or more accurately should UNDO, to help the local marketplace. Removing every freedom-destroying barrier that robs value from privately-owned property would be a good first step. And being allowed to rid ourselves of 19th century buildings and attitudes would be a good second. So here we are in the 21st century pleading for more freedom in the local marketplace. Clearly, Albany hasn’t progressed as much as you apparently believe. Separating “free market” from pursuing the common good” is a common canard. There are several examples that turn the Shadle thought sideways. For instance, I do not have the power to create a nuclear weapon. I do not know for certain that I even need a nuclear force. However, I cede that power and decision making to a large government agency, paying for whatever I’m getting through taxes. I do not have the power to build a water treatment plant. I cede that power to an agency with expertise in such matters, supporting said activity by my tax dollars. The list of examples is nearly endless in a complex society like Albany, Oregon. The problem is not in the ceding of power to others for purposes of governance. The problem is making certain that the Power Players are rotated out of their positions on a regular basis. If Mr. Shadle is concerned about CARA’s activities – and no one suggests he shouldn’t be – then perhaps Mr. Shadle ought to seek a position on whatever board or commission that manages their decision-making process. 100% patently false – and you know it. Tax increment financing is supposed to use the increase in the value of property to pay the bill. To some extent it does that, but it gets ALL of the increase, all that the construction causes and ALSO ALL that is plain inflation due to other causes, such as government printing money. so government gets the amount of tax it got at the beginning of the URD. If the URD lasts a long period of time, government has to pay the new inflated price of things like fuel Diesel cost $1.75 in 2000 last year it cost $4.00, the $2.25 difference to run the street sweeper comes from elsewhere…. not the Cara District. Hence, we either stop sweeping downtown, make a special tax to cover the shortfall paid by Cara District only, or spread the difference out among the rest of the city….. guess which one we are doing??? But it seems the streets that get CARA support are the ones that get swept MUCH more often. Pleased to meet you. Now you have met one property owner who was very pleased when my house value dipped 8 years ago. I am greatly displeased that it has gone up again. I would be ecstatic to see it’s value drop by half. I am totally honest here. It’s not just my tax bill, but the plight I see my children (in their 20’s now) suffer, as they are priced out of housing due to ever increasing home values and stagnant wages. Obfuscation seems to be the national pastime for Councilor Kellum as well as some other City Council dwellers. Many thought that outright falsehood from the political class was a new phenomenon, made exceptionally apparent by our new Commander in Obfuscation, Donny Trump. But there is a long and hallowed tradition of hiding the truth from the people by fobbing-off half baked ideas as reality. Even here in River City, we seem to be suffering a barrage of baloney from certain leaders. Whether there are increases to a tax bill or fees for something else so it can pay for the lost revenue is irrelevant, there is a transfer from people outside the Cara District to replace the monies taken by Cara which are above the amount generated by increases in value inside Cara, the state pays for the schools loss for all of it, other city dwellers pay extra for the loss of monies Cara takes for the inflation portion of the increase in the Cara district. You either pay money, or loss of services, if you like the fact that your house goes up in price due to inflation, ok but it is not extra money, just a devalue of the money you have, that is what inflation is.. so the increase is just keeping you from losing actual value.. If one follows Kellum’s logic, then one can only conclude that the government has almost no business doing anything at all for the benefit of the governed. By definition, Kellum would seem to prefer that the government do nothing at all because when government spends money, it takes away from something else. If it were true that these other entities Kellum wishes had all their money to spend as they see fit, one can imagine the hodge podge the community would resemble. Those things hitch would not be of interest to the monied class would be ignored, while those activities favored by those with the wherewithal would be properly funded….at least out th front doors of the folks with cash. Kellum’s thinking old quickly compartmentalize citizens into even more hardened socio-economic strata, making overall community progress nearly impossible. You can like what CARA does or not, but at least CARA has a track record taxpayers can follow to see here their dollars are going. The Kellum philosophy, such as it is, leads to opaqueness, precisely what the American electorate now faces with the Liar-in-Chief, Trump. Pulling in unrelated things to sow fear and dissatisfaction. Canards and junko logic might sell well lately, but they don’t promote the common good. Civics and history lessons dating back to the 50’s frame a much different picture for me. The federal government is a democratic republic. State and local governments follow the same pattern. None of our governments are democracy or anarchy. None require personal approval of every dot and tittle. Only one correction Hasso. There are nine residential units (3 on first floor and 6 on the second floor) and 2 offices. Tony and Gordon are master prevaricators of bovine effluent. Let’s be honest here, regardless of whether or not one improves their property, the county will definitely increase one’s tax bill 3%, compounded each year — before extra taxes due to bonds are thrown in. I have the tax records on my Albany house for the past 20 years to prove the above statement. The slight dip during the housing bubble pop was more than made up for by increases of 6%, 8% and more in other years (due to passing of bonds on top of the 3% increases). That said, I disagree with Tony and Gordon. It is not immaterial if grants such as this lead to increased appraisals and ultimately increased property taxes. In this case, it is an investment that is likely to pay enough in the future to cover the cost. This is not the case for investments which have gone bust, or for ‘street improvements’. Regarding the power of the government. Yes, the people do grant power to the government which they citizens do not have. The very existence of a police force is evidence of that. We grant the power to police to forcibly take down and restrain civilians that would be criminal if done by a citizen (or parent even). Taxes in general are another. We have voted in representatives which pass taxes (forcibly take money) from citizens. If you or I did this, it would be extortion, but we have given this right to our local and national governments. I dislike our tax structure in very many ways. In particular, the property tax is absolutely an unfair tax –as it is not based on one’s ability to pay (as is the income and sales tax). I have a right to run for office and try and change it. I may yet do so, but for now, I have an obligation as a citizen to recognize that while unfair, such taxes are still legal. Agreed, it’s the county. But that was not the point of Tony’s email. I disagree with Tony, but it is disingenuous to to object due to his mistake of ‘city’ vs ‘county’ — both are government entities which assess property taxes and bond repayments to property owners, over which he has no control. That was his complaint. I suggest that recipients of CARA funds be ineligible for further CARA funds for a period of 5 years AFTER the TOTAL completion of their current project. If they want an “extension”, it just delays their application for future funding by the same amount of time. Extensions are a failure of the recipient to live up to the original agreement. There should be “some” type of penalty. This would result in a self imposed one. Limiting the number or amount of “grants” received would help dispel accusations of favoritism.